“Arrastão” powerfully recalls Dorival Caymmi‘s lyrics about fishing, the sea, and the goddess of the sea Yemanjá. Fittingly, Edu began composing the song during a music session at Dorival Caymmi’s house. Dorival was singing “História de Pescadores,” and during the third part, “Temporal,” Edu began composing a response, which became the base of the song. Vinicius de Moraes’ lyrics reveal his involvement at the time with Afro-Brazilian mystical themes; the following year, he released the album Afro-Sambas with Baden Powell. Yemanjá and Janaína are names for the goddess of the sea in the Afro-Brazilian sycretic religion Candomblé. Catholicism’s Santa Barbara is represented in Candomblé by Yansã, the goddess of wind and storms. Our Lord of Bonfim is the syncretic counterpart of Jesus. 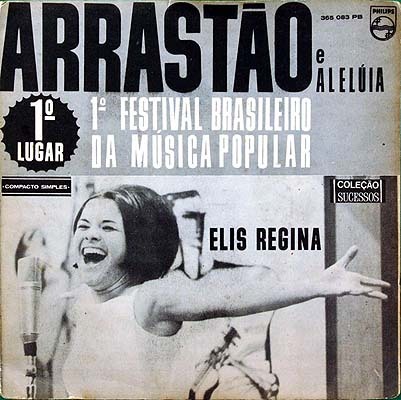 Although “Arrastão” is not explicit in its protest, it is identified as a protest song because of its regionalist and populist undertones. The song evokes a scene from a poor, remote northeastern fishing village, yet was written and performed by young, upper middle class, urban and well-educated Brazilian artists. The element of protest, then, lies in the attempt to draw the urban masses’ attention to social realities in Brazil during the early years of military dictatorship in the country. These kinds of messages were absent from the classic bossa nova songs from a few years earlier, which reflected an optimism that didn’t really consider what was going on outside of Ipanema. Edu Lobo, identified among a “second wave” of bossa novistas, was born in Rio de Janeiro in 1943, son of the composer Fernando Lobo. He began playing accordion as a child before switching to guitar. He was profoundly influenced by Dorival Caymmi, and in the early 1960s began playing with Caymmi’s eldest son, Dori. He composed his first song with Vinicius de Moraes in 1962, “Só me fez bem,” and went on to collaborate frequently with Vinicius, Tom Jobim, and Chico Buarque. The I Festival of Música Popular Brasileira was such a hit that TV Record, a competitor of Excelsior, immediately appropriated the show, staging a competition by the same name the following year. The military dictatorship shut down TV Excelsior in 1970. If you post a photograph in addition to the links, when I share a post up to Facebook, it would give me a thumbnail other than the WordPress logo (which I then don’t display). Just a thought – might increase traffic back to the blog with a visual. Thanks again for another great post. I find the historical information to be very interesting and it enhances my experience of the music. Thank you, that’s a great suggestion! I have been trying to remember to add images, but had forgotten with the last couple posts. Thanks! And thank you for following and sharing.